Restaurateurs around the world are seeing a marked rise in the need for advanced technology in their restaurants. Why? To meet consumer demand. Now more than ever, consumers expect to be able to easily locate up-to-date information about nearby restaurants from wherever they are, as well as stay in the loop about what’s happening in their local dining scene. According to USA Today, since January 2011, Starbucks has logged over 100 million mobile transactions from its new payment app. T.G.I. Friday’s has its own app that allows customers to start and pay their tab directly from their smart phone, without the involvement of a waiter. This allows for faster turnover, which is good for both the patrons and restaurant owners alike. Forbes admits that, while many restaurants have been slow to take to new technologies, a few chains are implementing some ground-breaking innovations. Fast food chains such as Domino’s Pizza have been using their mobile ordering platform in order to allow customers to place their order from any smart phone or computer with internet access. IPad order kiosks are being tested in some restaurants to enable customers to place their order at a kiosk rather than waiting in line. This is believed to prevent walk-aways and result in more orders, as the wait time will no longer be a factor. Facebook ordering has the potential to become a huge money-maker, since the majority of customers have a Facebook account already, and implementing a Facebook-based ordering app is fairly low in cost. Customers seem to like the idea of tabletop e-waiter and checkout, as it allows them to keep an eye on their credit card, and shortens the wait time of checking out when they’ve finished their meal. One such solution is E la Carte’s Presto tablet, and is reported to cut 7 minutes off of the average diner’s stay. Many restaurants have implemented digital menu boards for easy menu changes as well as customer entertainment. Now, it has become much easier to change prices and items on a menu board, without having to manually change everything. Also, this can add a level of interactivity, where patrons can play games such as trivia, tic-tac-toe and more against each other by using their smart phones. Another innovation along these lines is called games while you wait, which entertains customers while they wait for their food to be prepared. 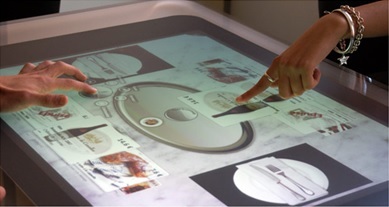 In certain McDonald’s locations, gesture-enabled games are projected onto the restaurant floor so that the children can play games to pass the time. More and more restaurants have taken to accepting online coupons, because customers love saving money, and a happy customer is a return customer. Integrate your loyalty and rewards programs into apps and other technology options. In addition to being the number-one feature cited by Baby Boomers as a desirable tech option, two-thirds of consumers overall say they’re more likely to patronize a restaurant that offers a loyalty program. If you offer nutrition information for menu items, consider adding it to smartphone apps, and as a mobile-optimized page on your website. Overall, more than seven out of 10 consumers say they are trying to eat more healthfully when dining out now than they did two years ago. Consider adding information on parking options to website and smartphone app sections listing locations and directions – do you offer valet services, is there a designated lot, or do you have guidance regarding street parking? Eight in 10 consumers say parking factors into their restaurant selection process. When adding onsite kiosk/touch-screen ordering options, consider the font and button sizes of what appears on the screen to accommodate for easy viewing. Also consider highlighting healthful menu options and customization opportunities throughout the ordering process, as Baby Boomers are particularly interested in those options when dining out.